INDIANAPOLIS – In the record books, the 96th Indianapolis 500 will show that Dario Franchitti won the race, giving him three victories in The Greatest Spectacle in Racing. But those who spent the hot, sultry afternoon at the Indianapolis Motor Speedway or watched the very competitive race on TV now know that Franchitti was not alone in the cockpit of his Target Chip Ganassi Racing Dallara. Dan Wheldon was right there with him. Wheldon won the Indy 500 twice, including the 2011 edition. Five months later, the much-loved and admired Englishman was dead, the victim of a horrifying multi-car crash at Las Vegas Motor Speedway. Sunday’s race was a virtual love-fest for Wheldon, with the fans issued white sunglasses in the tradition of the chic Brit to wear on laps 26 and 98, the numbers of the two cars in which he won here. His name was on every driver’s lips throughout the days leading up to the race, and it was there again after Franchitti sent Takuma Sato spinning into the wall at the start of the final lap as the two battled for the lead. he joined Louis Meyer, Wilbur Shaw, Mauri Rose, Bobby Unser, Johnny Rutherford and Helio Castroneves as a three-time Indy winner. Only A.J. Foyt, Al Unser Sr. and Rick Mears have won four times. 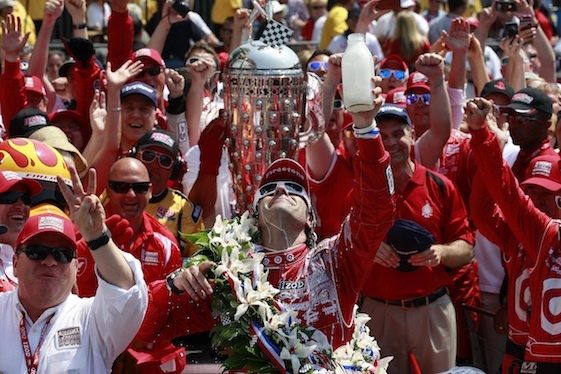 Franchitti donned white sunglasses in Victory Lane and pointed to the sky after drinking from the traditional bottle of milk. Susie Wheldon, Dan’s widow, spent the race in the pit of Ganassi teammate Scott Dixon, who finished second. She and Dixon’s wife Emma are close friends and the Dixons moved to St. Petersburg, Fl., following Wheldon’s death to lend support to Susie and her two children. Susie was one of the first people to reach Franchitti to give him a congratulatory hug. “We just shared a moment,’’ Franchitti said. She then joined Franchitti and his wife, actress Ashley Judd, on the joyous victory lap around the oval on the back of a truck, all of them waving happily to the thousands of fans who waited in the sweltering heat for the winner to ride past. Dan Wheldon and wife Susie. The race ended under caution, the same as in each of Franchitti’s first two Indy victories. And this time, very appropriately, third place went to KV Technologies racer Tony Kanaan, one of Wheldon’s close friends. Kanaan, who has led a ton of laps here without winning, showed no disappointment at failing to win Sunday, although he said numerous times in recent days how much it would mean to him to have his face on the Borg Warner Trophy next to Wheldon’s. “I think Dan would be proud that his three best friends finished 1-2-3,’’ the Brazilian driver said. “I don’t think there could have been a better result for Dan. He would be giving Sato a hard time for crash, patting Dario on the back and he was going to call me a wanker because I didn’t win this thing.